For Matt's birthday, we're bringing over two stalwarts of the Vancouver drum & bass scene. From the Digital Motion crew, BULLET BILL and the DJ formally known as Bias, CALICO. Expect some real heat from these guys! 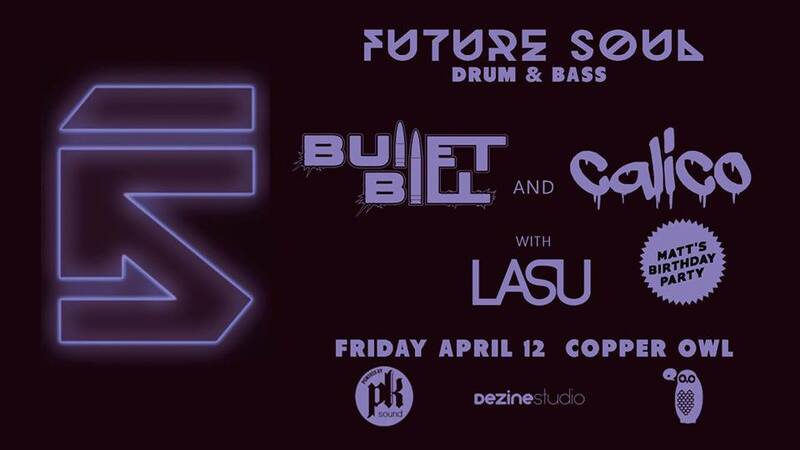 Local stud, LASU will warm up the bassbin. 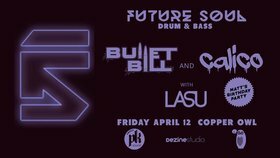 Over years of dedicated persistence and the raw need to push the boundaries of dance music and sound culture forward, Bullet Bill always delivers really good forward thinking music to the masses. Whether through his live mixing, scratching, mcing or production he is all about striving to be the best in what he does, true thru versatility and leaving all dance floors encountered in sheer mayhem. With 20 years of solid dj experience, he is regularly seen performing at premiere sound venues across Vancouver, BC and Canada billed among some of the biggest artists on the globe. Be on the lookout for Bullet Bill as he continues on the journey deeper into the future of music & soundsystem culture. Calico (formerly Dj Bias) has been a Dj in Vancouver since 1999 when he purchased his first set of turntables after listening to skratch djs, quickly tho he was introduced to Drum n'Bass music and fell in love with mixing. Things then really started heating up for when he started a weekly Drum n’Bass night at The Met called ‘Fixed Fridays’ which went on for 4 years in Vancouver. At the same time Bias also was part of a weekly Drum n’Bass radio show on local UBC radio CiTr 101.9 fm called ‘Shadow Jugglers’ with fellow Jungalist rudegal ‘MP’. He has had the honour to open for artists such as Chase & Status, Nosia, Subfocus, Pendulum, Dj Hype, Dj Fresh, Kenny Ken, Marcus Visionary, Nicky Blackmarket, Remarc, Dj Zinc, Rusko, Djunya, Luke Envoy, Babylon System, Deaga Sound, and Danny Byrd just to name a few and played all across Canada and into the US all the way to Scotland UK. When Dubstep and bass music was starting to come into the scene in the late 2000s Bias was also a strong supporter playing the odd dubstep track at Fixed Fridays before also fully embracing that sound and throwing Dubstep as well as Drum n’Bass parties and doing a radio show on Dubstep.fm. If you’ve seen Bias play then you know he doesn’t mess around and always pushes the technical limits of Dj-ing as well as having deep selections of music. Fast forward to 2018 and now he is going by the name Calico and he is going strong with a radio show every second friday 8pm-10pm on Sub.fm. Calico plays and loves a large variety of music from Dubstep, Grime, Trap, Bassline, and general rudebwoy bass vibes but will always be a strong supporter and advocate for his first love Drum n’Bass and Jungle music.